Get your first real look here! 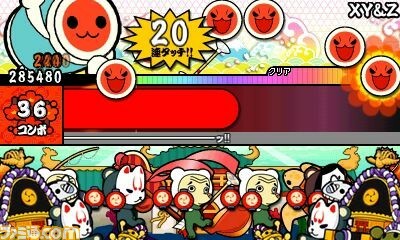 Taiko Drum Master is an oft-overlooked rhythm game that simply didn't get its due here in the west. It continues to flourish, however, in Japan, with the latest 3DS iteration launching June 16 in Japan. 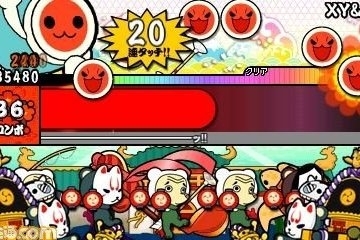 It's called Taiko Drum Master: Doko Don! Mystery Adventure and it's got a brand new "Mystery Adventure Mode" that's a lot different from what we've seen in the past from the series. This time around, you get to travel around the in-game world with Don-chan and Ka-chan (those are the two drums, if you weren't already in the know) and get yourself involved in musical battles a la the regular Taiko Drum Master games. There's even the option to build a party up to travel around with, where you can have up to eight different characters. The game is releasing this June 16 for 4,800 yen, so if you're importing that sweet new Famicom 3DS XL like I am (and you absolutely should be) this might be a game you want to play too! We can be import friends together, you and I. It'll be fun. I promise.